The Mayhem Leadership program is designed to give select high school athletes the opportunity to shadow and assist the Mayhem coaching staff in order to learn key skills needed to teach and motivate young athletes. Leaders will be taught to be self-assured when speaking in public, to have empathy and social attentiveness when athletes are struggling to learn, and how to deliver persuasive instruction in appealing ways to a specific (young) audience, and finally, how to be endlessly positive despite daunting tasks at hand. Mayhem leaders will assist Mayhem coaches in the U10, U12 & U14 Spring Training program by demonstrating and instructing skills in group and individual settings, coaching scrimmages, refereeing, interacting and giving direction to athletes and parents, and being pro-active in handling administrative and equipment needs. Leaders will be included in coaching staff discussions regarding daily operations and will be given an evaluation of their leadership skills at the end of the season. Mayhem is proud to hire leaders who have successfully completed the program and have gone on to compete at the collegiate level to join the Mayhem Alumni Coaching Staff. 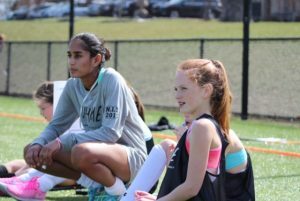 “I am always proud to tell people that I am part of the Main Line Mayhem Field Hockey Club. Playing for Mayhem means that I am part of a community of teammates, coaches, and families that all are working toward bettering their skills, supporting each other, having fun, and striving for excellence. Mayhem has helped me grow in my athletic abilities and skills, confidence, and gave me the opportunity for my first international experience that I will never forget. It may sound funny but when I put my uniform on and tuck in my jersey before I walk on the field, I feel a sense of pride and awareness of all that Mayhem represents. For me it is personal.